Smitha Rao and J.-C. Chiao designed and built the device that is about 1.8 mm at its widest point. 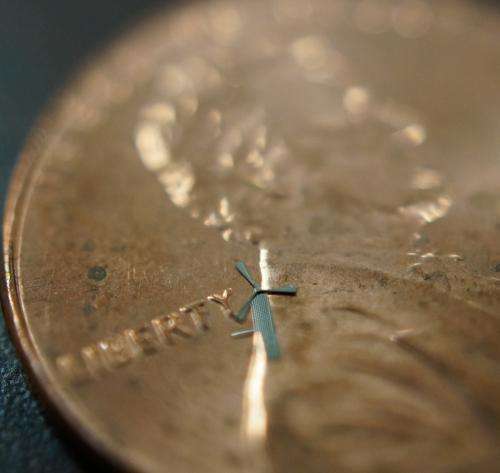 A single grain of rice could hold about 10 of these tiny windmills. Hundreds of the windmills could be embedded in a sleeve for a cell phone. Wind, created by waving the cell phone in air or holding it up to an open window on a windy day, would generate the electricity that could be collected by the cell phone's battery. Rao's works in micro-robotic devices initially heightened a Taiwanese company's interest in having Rao and Chiao brainstorm over novel device designs and applications for the company's unique fabrication techniques, which are known in the semiconductor industry for their reliability. "The company was quite surprised with the micro-windmill idea when we showed the demo video of working devices," Rao said. "It was something completely out of the blue for them and their investors." Rao's designs blend origami concepts into conventional wafer-scale semiconductor device layouts so complex 3-D moveable mechanical structures can be self-assembled from two-dimensional metal pieces utilizing planar multilayer electroplating techniques that have been optimized by WinMEMS Technologies Co., the Taiwanese fabrication foundry that took an initial interest in Rao's work. "The micro-windmills work well because the metal alloy is flexible and Smitha's design follows minimalism for functionality." Chiao said. WinMEMS became interested in the micro-electro mechanical system research and started a relationship with UT Arlington. Company representatives visited with the UT Arlington team several times in 2013 to discuss collaboration. An agreement has been established for UT Arlington to hold the intellectual properties while WinMEMS explores the commercialization opportunities. UT Arlington has applied for a provisional patent. Currently, WinMEMS has been showcasing UT Arlington's works on its website and in public presentations, which include the micro-windmills, gears, inductors, pop-up switches and grippers. All of those parts are as tiny as a fraction of the diameter of a human hair. These inventions are essential to build micro-robots that can be used as surgical tools, sensing machines to explore disaster zones or manufacturing tools to assemble micro-machines. "It's very gratifying to first be noticed by an international company and second to work on something like this where you can see immediately how it might be used," said Rao, who earned her Ph.D in 2009 at UT Arlington. "However, I think we've only scratched the surface on how these micro-windmills might be used." The micro windmills were tested successfully in September 2013 in Chiao's lab. The windmills operate under strong artificial winds without any fracture in the material because of the durable nickel alloy and smart aerodynamic design. He added that it has been fulfilling to see his former student succeed and help move innovation toward the marketplace. "To see a company recognize that and seek you out for your expertise speaks volumes about what UT Arlington means to the world," he said proudly. PARC goes xerographic: Is that any way to make a computer? "A UT Arlington research associate and electrical engineering professor have designed a micro-windmill that generates wind energy..."
Look for this technology in the storeroom... never. Can't wait for the genius who tries to charge their phone by running tap water over the windmills "to make them go faster". I could use a panel or two on my yacht. I wonder how they compare with conventional propellors with regard to efficiency? Why do all of these harebrained schemes purport to charge a cell phone? This has to be the 10th article where some new energy device is used to charge a phone. Because they reckon humans these days can't function at all without a cell phone. "Because they reckon humans these days can't function at all without a cell phone." No, it has to be something deeper than that, perhaps something in the grant writing process. Perhaps research on "Green" consumer energy devices is the hot grant ticket. How do they actually generate electricity? I see a tiny set of blades in the picture but nothing that would create electricity. Do they work on a piezo principle or what? Why do all of these harebrained schemes purport to charge a cell phone? the cell phone is just an example (andnot a very good one) where this could be useful. The mentioned method is just one of many tricks scientists are developing to make harvesting of minute energy sources a reality. Anti I don't see how trillions of sources of micro-power could ever be connected together in an economical fashion to provide any sort of grid type power. Yes, and now calculate the power output of a windmill with a swept area of 1 square millimeters. There is ambient energy everywhere, but it is so dilute that collecting it up with devices like these gives you nanoscopic amounts of power. It's the same problem with other devices that purpose to capture stray electromagnetic radiation, or convert your body heat or walking motion into power. There's only really enough accessible power to wind up a wrist watch and that's it. In practical reality it's the same sort of proposition as yelling into a coffee cup to make it heat up from the sound energy, because a sizeable battery like one in a cellphone will actually leak more energy faster than your mini-windmills can charge it up. They run into the Reynolds number when they try to scale down in size, Beyond a certain point the wind behaves like it is molasses. And due to that very reason, the airspeed next to a surface is greatly slowed down to the point that there's barely any energy to be extracted from it. It forms a thin contact layer that doesn't really move at all.